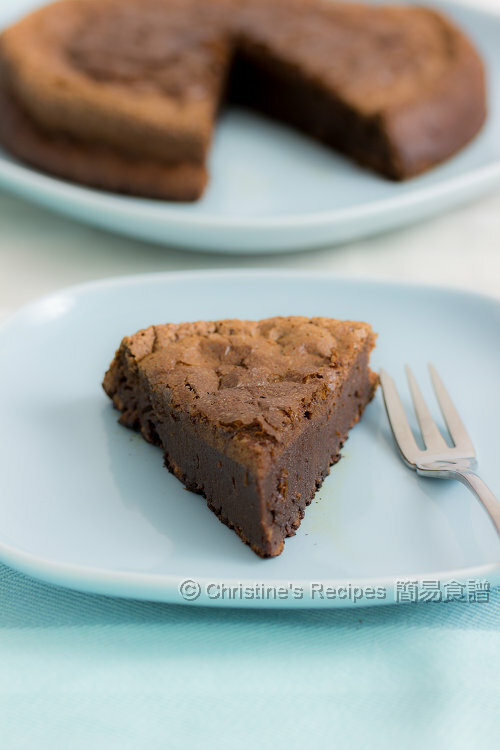 If you’re a big fan of Nutella like me and my daughter, this is a Nutella cake recipe for you. No flour is needed. With only 2 ingredients, you can make this yummy cake on the go. The main ingredients of Nutella are hazelnut and cocoa. So, you can imagine this yummy cake is full of chocolate flavour. Oh another important kitchen gadget you might need is an electric mixer that will make the job done perfectly and easily. Or else, you need more elbow grease to beat the eggs with a balloon whisk. Sounds easy enough? Give it a go then. Prehaeat oven to 175C / 350F. In a large mixing bowl, beat the eggs with an electric mixer on high speed for about 7 to 8 minutes, or until really fluffy and tripled in volume. Spoon Nutella in a glass mixing bowl. Heat in a microwave for 30 seconds or use a double boiler to soften. Lightly fold in the whisked eggs at least in three batches. Make sure there’s no trace of eggs between additions. Pour batter into the lined pan. Baked in the preheated oven for about 25 to 30 minutes, or until an inserted needle comes out clean. Remove from oven and let cool completely. Remove from pan and serve. 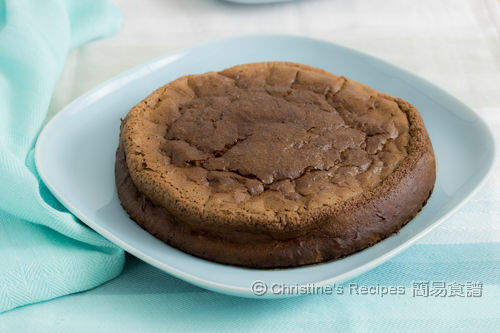 As this cake doesn’t incorporate any flour, it will shrink a bit after cooling down. But the texture is very smooth and light. Make sure that the eggs are beaten well enough and tripled in volume. Otherwise, the texture won’t be light and soft. 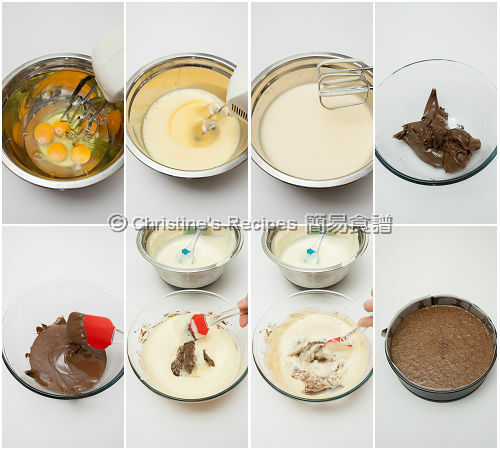 You can use a double-boiler to help Nutella turn soft a bit instead. Yet, make sure not to heat up Nutella too much. When folding the eggs with Nutella, you need to move fast with a light hand. Don’t knock out the air as much as possible. Do remember to line your pan with baking paper. 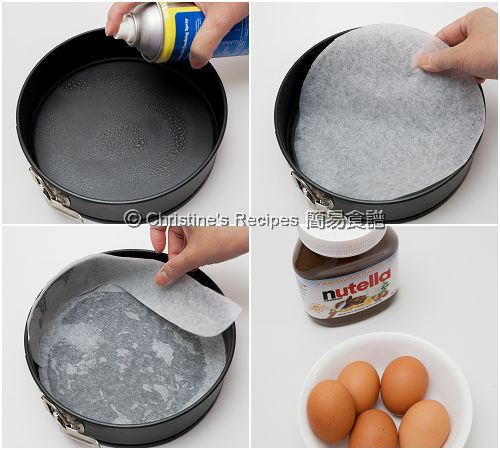 Without doing this step, the cake will stick to your pan and make your cleaning job become a nightmare. I like flourless sweets. This looks very moist and great! I am ok on Nutella, but my sister love it. This seems simple enough that not even I can mess up. Looking forward to it! Wonderful. I like walnuts too. Very clever idea. Here you go, the Chinese version. Made this cake and it was so simple and delicious! Can we make this a microwave? Of course you can. But you have to test the cooking time yourself. I made this for my husband's birthday. It was wonderful! It will become a family favorite for this gluten-free family! I served with Frangelico sweetened whipped cream, chopped hazelnuts and sliced strawberries. Thank you for a fantastic recipe! Awesome! Glad that you liked this recipe. Isn't this recipe by Matt Preston? And I don't see any credit mention at all. A friend shared with me. Your question made me curious, so I googled and found it's quite different, amazed with so many versions on the internet.